Angry Penguins was an Australian literary and artistic avant-garde movement of the 1940s. 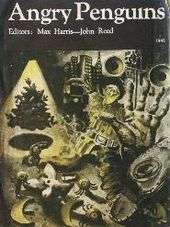 The movement was stimulated by a modernist magazine of the same name published by the surrealist poet Max Harris, who founded the magazine in 1940, at the age of 18. Angry Penguins was first published in the South Australian capital of Adelaide. The title is derived from a phrase in Harris' poem "Mithridatum of Despair": "as drunks, the angry penguins of the night", and its use as a magazine title was suggested to Harris by C. R. Jury. The magazine's main Adelaide rivals were the Jindyworobaks, a nationalist and anti-modernist literary movement inspired by Indigenous Australian culture and the Australian bush ballad tradition. According to Angry Penguins poet Geoffrey Dutton, "we stayed with Yeats, Eliot and Auden, ... and left Lawson and Paterson to the Jindys." In 1942, Harris gained the patronage of John and Sunday Reed in Melbourne, and the magazine subsequently moved to the couple's home at Heide (now the Heide Museum of Modern Art). The Angry Penguins were early Australian exponents of surrealism and expressionism. This led James McAuley and Harold Stewart during their time at the Directorate of Research and Civil Affairs to create the group's most famous event, the Ern Malley hoax and the subsequent trial for indecency. Members of the painting group included John Perceval, Arthur Boyd, Sidney Nolan, Danila Vassilieff, Albert Tucker and Joy Hester. The Angry Penguins movement was surveyed in the 1988 exhibition Angry Penguins and Realist Painting in Melbourne in the 1940s, held at the Hayward Gallery in London. In the exhibition's catalogue, English novelist C. P. Snow is quoted as saying that the Angry Penguins movement "was probably the last flowering of a 'national' modernism that a completely internationalised world of the arts was likely to see". In Richard Flanagan's Booker Prize-winning novel The Narrow Road to the Deep North (2013), the main character, Dorrigo Evans, meets the love of his life at the launch of Angry Penguins. ↑ Keon, Michael (1 August 1989). "Angry Penguins at home and abroad", The Age. ↑ Hayward Gallery. Angry Penguins and Realist Painting in Melbourne in the 1940s. London: South Bank Centre, 1988. ISBN 1853320218.